More than meets the eye — The Doylestown Food Co-op Eco-System Partners, Basically Burgers and The Sweet Spot among others, offer discounts to members. When I first saw the signage for the Sweet Spot, I assumed it was just another ice cream shoppe or maybe one of those new Fro-Yo places. Then I saw the large fish tank in the window and became a bit confused. A quick glance at the menu revealed that this unassuming little establishment featured Caribbean cuisine. Hmm, now I was really intrigued. Upon learning that the Sweet Spot and its neighboring eatery, Basically Burgers, were supporting the Doylestown Food Co-op with a fundraiser, my husband and I had a great reason to give it a try. Within minutes of walking in the door, we found ourselves on Caribbean time. The overall vibe is relaxed — kind of like being on vacation. You can even shoot pool while waiting for your food! In that regard, the Sweet Spot certainly succeeds. Over the past several months, it has become one of our go-to eateries. Our favorite menu items include plantains and/or Dunkin’ Shrimp with three delectable dipping sauces, the Cuban Sandwich, Waldorf Salad and, quite possibly, the best black bean soup we’ve ever tasted. For added fun, you can wash it all down with an Island Fruit Smoothie. Once when dining with my friend Denise, I showed my Doylestown Food Co-op card to the owner/waiter and was surprised to hear him say, “Thank you for supporting OUR Co-op.” Wow! Serge got the message—all of us are owners in this Co-op Community. Some people have been waiting for our store to open to join the Co-op, but what they don’t realize is that the Co-op needs their support NOW in order to make the store a reality. Did you know that the Doylestown Food Co-op is 230 member-owners strong? And, did you know that members receive benefits even before our store is opened? 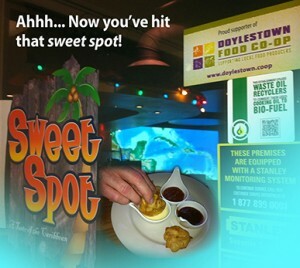 The Doylestown Food Co-op currently has more than 24 eco-system partners, like the Sweet Spot and Basically Burgers, who offer discounts to members. Speaking of Basically Burgers, it’s another great destination for satisfying a specific craving. On occasion, I desire a nice juicy burger — and I don’t mean a frozen fast-food patty; I want the real thing. And Basically Burgers is the real deal — serving mouth-watering gourmet burgers made to order with high quality, organic, hormone-free beef. Whether you are looking for a hometown gourmet burger or an island-inspired dining experience, these two eco-system partners of the Doylestown Food Co-op are, well… Basically Sweet! Pat Achilles on Green Eye Wins a Benny Award!